Congratulations to Emily Hayward! Vetpro sponsored rider, on her win taking out the Olympic Cup, Horse of the Year Title on Belischi HM as well as Young Rider of the Year. Replace electrolytes lost through sweat with Vetpro Equine Electrolytes. Natural Fly Repellent, a natural deterrent to flies and biting insects. Safe for you and your horses! The Effects of Sun on the Equine Skin, read our article about the positive and negative effects of sun on your horse. How Hot can a Horse Get? Find our about body heat and cooling your horse down safely. A unique powder formula that blocks all UVA and UVB rays. 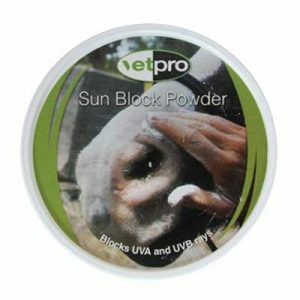 Easy to apply and lasts 24 hours minimum, great for protecting the white skin of animals that’s susceptible to sun damage. Veterinary Professional Services Ltd – Vetpro – provides a comprehensive range of veterinarian developed, scientifically produced nutraceuticals and therapeutic products, manufactured in a MPI-NZFSA registered facility to GMP and ISO 9002 standards. Vetpro markets its own brands of supplements & therapeutic products plus distributes Supporta bandages & first aid products, Equifix therapeutics, Robinson’s Animal healthcare, Arctic Blast cooling therapy and Lillidale horse care and 4Dogs ranges. Copyright 2018 Veterinary Professional Services Ltd. All rights reserved.